There is a huge proliferation of advice in skin care and makeup products in the marketplace today, and fiercely competing for consumer attention and their beauty dollars. Our media is bloated with print advertisements along with endless infomercials and TV home shopping programs devoted to hawking the latest and greatest in cutting edge cures for preserving and extending beauty. Now that HDTV is mainstream, the anxiety level of how well skin appe ars in super lifelike reality is causing great concern on both sides of the camera. This further drives the angst in deciding about what is truly healthy or the best choices in skin care, not only in summer, but year round. The self-image and well-being is tightly intertwined with (one’s) perception of physical appearance, so it’s almost a full time job in sorting out what information is fact, fiction, or just plain folly to follow! A – Asymmetry: Normal moles or freckles are completely symmetrical. B – Border: A mole or spot with blurry and/or jagged edges should be evaluated by a doctor. C – Color: A mole that is more than one color is suspicious and should be evaluated by a doctor. D – Diameter: If it is larger than ¼ inch or 6mm, it should be evaluated by a doctor. 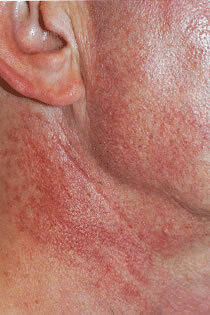 E – Elevation: A mole that is raised above the surface and has an uneven surface should be evaluated by a doctor. My dermatologist states undeniably that the two major culprits of pre-mature aging (including lined and wrinkled skin) is the external overexposure to the sun’s ultraviolet rays, and the internal breakdown of skin band proteins known as collagen an d elastin. Pre-mature aging is largely self-inflicted through careless exposure and lack of knowledge in skin maintenance. Ultraviolet rays damage the DNA in skin cells triggering the release of inflammatory substances that cause cells to mutate or self-destruct. These cell mutations can also lead to pre-cancerous cell growths. The visual results of this destruction over time look like thinning and sagging skin with “age” spots such as brown, white, or liver colored spots. Uneven or ruddy skin tone and blotchy looking redness often appears, and is permanent. Repeated unprotected sun exposure or sun tanning over time contributes to a skin texture that is rough or crepe-like, or even leathery looking. It also causes skin to greatly decrease in its natural moisture holding capability so skin acts and feels drier as you chronologically age. It’s the harsh reality, but being forewarned is forearmed, as the saying goes. What are the steps you can take to protect and nurture your beauty AND enjoy the outdoors this summer? It goes without saying that the wearing of sunscreen with a minimum SPF rating of 15 is the one thing that is powerful in protection. I am talking about a sunscreen specific product formulated for protection, NOT a makeup product that has sunscreen in it! Find one you like and wear it as your moisturizer under makeup as well as on exposed skin during the summer months. Because I am unusually sun sensitive now I also put on a large brim hat and wrap-around style sunglasses when I head outdoors, in addition to “protective but pretty” layers of clothing. On super hot and sunny days for extended periods when I am outdoors, it’s always a good time to break out the umbrella for extra cover. Embrace the fact that the only safe tan is through a chemical tanning product. The chemical self tanners on the market today give amazingly realistic results now that you really can’t tell the difference between chemical tans from radiation (sun or tanning bed) tans. Collagen and elastin is the underlying foundation of skin, a fibrous network that is directly responsible for its smoothness and firmness. The best thing you can do to help this support structure retain suppleness and str ength is to practice protection with sunscreen and the methods mentioned above. 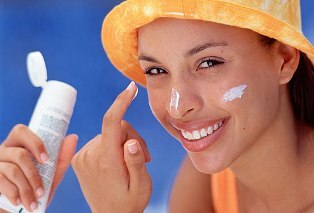 Zinc added to sunscreen has been shown to help reflect rays away from skin and lessen the impact of free radical damage which can also weaken the fibers. The antioxidant Vitamins C and E are clinically proven cell communication ingredients, and help protect them down to the deepest skin layers. They form a protective hydration matrix in the skin’s lipid layer, which actually boosts the effectiveness of moisturizers and sunscreens. Vitamin A (Retinol) has a long, clinically studied and proven history of being the most effective topical application that can actually stimulate collagen and elastin growth and strength. It goes without saying that serious skin care should include these ingredients in your daily routine. Finally, there is strong evidence that adding fish oils containing omega-3 fatty acids to your diet can greatly help in strengthening the skin’s natural lipid layer and making it more resilient against moisture loss, dryness, redness, and sensitivity during weather extremes, especially in summer and winter. If you tend to sweat a lot, or there is high humidity outdoors, you can bet on dehydration occurring both internally and externally through skin. Drink plenty of water during those times, so that your skin doesn’t lose the moisture balance in its lipid layer. If you do experience any unusual dryness in summer extreme weather, try my quick fix boost of applying organic coconut oil or olive oil (sometimes I mix equal parts together) as an emergency skin moisture rebalancer. These oils actually help restore the skin’s natural acid mantle and give it a boost back to normal function. Hope you found this helpful, and wishing you a safe summer skin experience! A footnote on this article: Scientists at Emory University tested the sunblock effectiveness of 25 different sun and rain umbrellas. What they found is thick canvas umbrellas block 99% of the sun’s UV rays. Black rain umbrellas block up to 95% while white ones only block 76%. Good to know, but don’t replace use for sunscreens. Use both! I am so glad that I came across this page. Thanks for writing up this awesome blog post. Definitely worth the read!